Farmers markets are the entry point in Toronto for entrepreneurs starting out in food and agriculture. Fairmount Market is committed to supporting these new businesses. What does this mean for you, as a patron of the market? It means that each year you will see a change in the vendor line up, allowing us to keep innovation in the food industry alive. 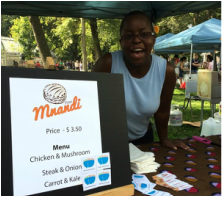 This year, the dollars that you choose to spend at our market will directly support growing businesses like Mnandi Pies and Cedarhedge Farms. With your help, businesses such as Tiffinday and Abokichi, have graduated from our market and on their way into the mainstream marketplace and they will be replaced with new entrants like Ignatius Farms and Life in Homemade. Stalwart mentors like BEE Hamlin, Manning Canning and Stanners Vineyard return to our market, setting the gold standard for growing and producing food we can proudly buy for our families, while supporting the agriculture industry in Ontario. Collectively, our choices find a fine balance in offerings and opportunities. We look forward to an amazing 2017 season. Artisan sheep cheese, yogurt, kefir, and other sheep dairy products. Smoked pepperettes, smoked & air dried Italian sausage, European air-dried salami. A family run small-batch artisan vineyard in Prince Edward County. New York style fermented pickles, mustards and hot sauce. Sustainably grown vegetables, fruit CSA. Raw honey and beeswax candles from Brian's unique local apiaries throughout Ontario. ​Handmade whole grain and sourdough breads, pastries and pizzas. Handmade, artisanal jams, jellies, preserves, shrubs and pickles. Handmade butter crust Zimbabwaen meat and veggie pies. Ice Pops created using the most seasonal, freshest and local ingredients available. Featuring unique local cheese and dairy products. Handmade mustards and salts. Polish sausage on a bun & pierogi. Fermented sauerkraut, kimchi and kombucha. Skin care products including bug spray, hand salve, scrubs, face oils, and organic essential oils. Made by hand with the highest quality organic ingredients. Vegan fresh flavoured pasta made with the highest quality and local Ontario ingredients. Featuring a variety of flavours of fresh pasta along with Sauces, Seasonal Pestos and more. Transparency is important to us and to the farms we invite to the market. We do our best to share our farms' practices and certifications. If a farm is "certified" organic, we have copies of those certifications. We do appreciate those farms that are transitional, working towards a complete organic practice and celebrate their efforts. Please do take the time to learn more about our farms by visiting their website (if available) or by chatting with them at the market. You will find wisps of wisdom and creativity and learn more about their farming practices.